The TARDIS is under attack. Alien plants have taken root in its corridors, their strange flowering tendrils threatening to rip the Doctor’s ship apart. When new companions Brandon and Alex venture into the heart of the TARDIS to discover the source of the infestation, they find a secret door, and a long-forgotten world. The Doctor has unfinished business with the Arborites, living trees with long memories. Centuries ago he fought to prevent a galactic catastrophe, but now his past has come back to haunt him in ways he never thought possible. Can the Time Lord rescue his young friends before they are destroyed by his past mistakes – or will Hirolth rise to leave utter devastation in its wake…? With the Doctor having gained a pair of American companions, the siblings Brandon and Alex Yow, BBC Audio retains the Stateside flavour of the previous release, The Lost Angel, by hiring Nicola Bryant to read this one. Okay, so she’s not actually American, but she famously pretended to be one when she was cast as Peri Brown in 1984. It is fleetingly weird to hear her referring to her most famous character when the Doctor makes mention of “poor old Peri”, as he recalls past difficulties with the American vernacular. Though this is the second of four linked audio books, there is no real indication of this on the product’s packaging or in listings on online stores. 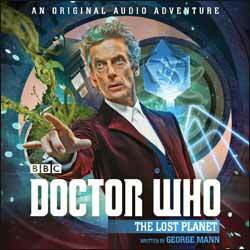 Fortunately, for any customers who may come to this without having heard the previous release, descriptions near the beginning of The Lost Planet act as a reminder of who and what the Doctor is, and how Brandon and Alex met him. Having set that up, however, writer George Mann then immediately diverts the trio from their mission to the 16th century, due to a plant infestation in the TARDIS. I found this story more immediately engaging than the last one, perhaps owing to the familiarity of the TARDIS setting and Bryant’s voice. She also provides suitably creaky, croaky voices for the tree-like Arborites (who fortunately have a wider vocabulary than “I am Groot”). Like her predecessor Kelly Shale, though, she doesn’t manage to crack Peter Capaldi’s accent. Also somewhat off-putting is David Darlington’s music, which is unusually intrusive, its discordant parps often sounding not unlike Keff McCulloch’s attempt at a Dudley Simpson style score on the video release of Shada. Whereas The Lost Angel started off slow and gained momentum, The Lost Planet began well but lost me a bit towards the end. However, with the mission back on track for a historical adventure in the next release, The Lost Magic, hopefully this series will find its mojo again.